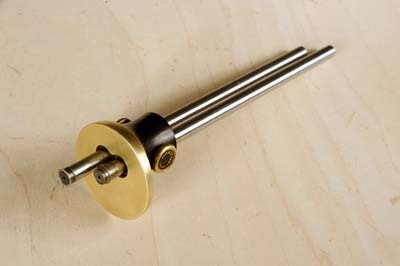 The Veritas dual marking gauge has two independently adjustable rods with wheel-type cutters fitted to each end. 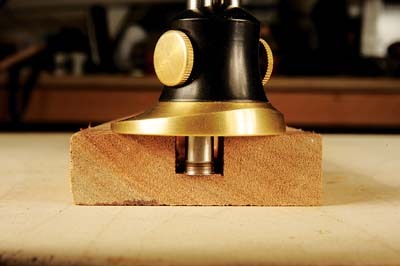 One cutter has its bevel facing in and the other one facing out, making it ideal for marking mortises. The stems can retract fully into the head, allowing the cutters to be used individually, which is useful, although it felt slightly unbalanced in this mode. Having said that, the gauge is perfectly comfortable to use with a good weight. Setting is easily done thanks to the rubber â€˜Oâ€™ rings contained within the body, that maintain a light but constant friction, and prevent the rods from sliding back and forth when you least need it. The hardened steel wheels cut the wood fibres, rather than tear them, even across the grain. The wheels are vulnerable to damage but can be fully retracted into the body when not in use. This device is really well made, as you would expect from Lee Valley, and has a number of features that make it a useful addition to any toolbox. I found that a little wipe of wax over the brass faceplate helped to reduce the friction between timber and metal, and made use far smoother. Itâ€™s not cheap, however!